We are grateful for the support of those who believe in the approach of PACAW Inc. for the education of these children, young men and women. With your financial support, we will be able to implement our objective. The objective is to produce young men and women who will be dedicated to turning their mind relentlessly to seek the truth, and who will be motivated to develop and secure the necessary environment within their nations for their citizens to nurture their talents and maximize their God given potential. Also, in the future, inventors, scientists, entrepreneurs, creative individuals, true patriots and leading public servants will be needed as " Guest Faculty" and motivational speakers. We are hopeful and looking forward to your support. We realize this would involve significant sacrifice in time commitment and traveling, and we thank you. 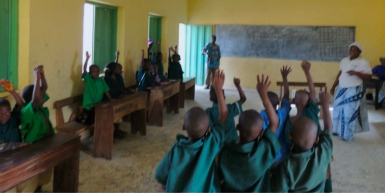 Class in session in primary school at Koro-Ekiti, Kwara State, Nigeria. Class teacher is far right and Dr. Ayeni is far left by the blackboard.